Born in 1899, Robert Kaufman emigrated from Russia and settled in New York. Like most immigrants who came to America at this time, Robert was eager to create a prosperous future for himself and his family. By the time he reached his early twenties, Robert had attained his goal as the proprietor of a very successful menswear company named Meadowpark Clothes. Unfortunately, after the stock market crash of 1929, he experienced the demise of his company. Robert continued to persevere and in 1942, from a showroom on Fifth Avenue in New York City, he set in motion the company that exists today. As a jobber for men's suits, the company endured a difficult wartime economy and emerged a successful fixture in the New York garment business. In 1944, Robert's middle son Alvin was diagnosed with a severe case of asthma. Following doctor's orders, Robert, his wife Edna, their three sons Saul, Alvin, and Harvey, and daughter Gladys had to relocate to Los Angeles. Although Robert practically restarted his business from scratch, the company flourished and he continued as a Los Angeles jobber for the next ten years. For a brief period during this time, Edna and Gladys ambitiously turned their Seventh Street office space into a thriving retail fabric store by adding a few well dressed mannequins to the window, and cleverly merchandising Robert's inventory. In the early 1950's, health issues left Robert unable to run the company alone and in 1955, he was joined by his sons Saul and Alvin. With the creation of a fabric named "Windjammer," Saul and Alvin began to move the company away from Jobber to Fabric Converter. "Windjammer," a rayon/cotton linen, became a hit with major department stores throughout the country. Following "Windjammer," Saul and Alvin introduced a line of velvets, plaids, and seersuckers as well as a program of printed chiffons and satins imported from Japan. Harvey, the youngest of the brothers, joined the company in 1963. With just Alvin, Harvey and Saul to run the expanding company and act as the national sales team, Harvey established a nationwide sales force. They continued to expand their line of fabrics, and in the mid 1970's, 100% cotton prints were introduced to the line as well. During these years and into the 1980's, sales to the manufacturing customer grew significantly. At the same time, the existence of fashion fabric retailers was dwindling and this shift in the retail fabric market pushed Robert Kaufman to focus on the quickly emerging quilting industry. Although a new market for the company, the transition was effective due to the expansion of Kona® Cotton Solids and the unique talents of their very first signature artists Debra Lunn and Michael Mrowka. With the further addition of Jennifer Sampou, Robert Kaufman was catapulted into the quilting mainstream. From this point to the present day Robert Kaufman has remained a dual focused company, with an equally held commitment to both the Manufacturing and Quilting Retail customer. Today, they operate two separate design studios, each one generating fabrics specific to the quilting and manufacturing customer. With the in-house quilting and manufacturing studios, run by Evie Ashworth and Debbie Call respectively, Kaufman also employs a large family of talented signature artists that supply innovative exclusive collections to the line. On top of these exclusive collections, Kaufman has the biggest offering of in-stock basics, including proven brands such as Fusions, Kona® Cotton Solids, and Artisan Batiks. Robert Kaufman also boasts a variety of designer collections, including collections by Valori Wells, Ann Kelle, Lunn Studios, Darlene Zimmerman, Jennifer Sampou, and Carolyn Friedlander. Though Saul passed away in 2011, Alvin and Harvey are still lovingly involved in the business their father began more than seventy years ago. Robert Kaufman Company continues the family tradition into the third generation with sons Joe, Steve, Ken, Ron, and son-in-law Eric now heading up the company's management. Robert Kaufman employees have become part of the Kaufman family, as well. 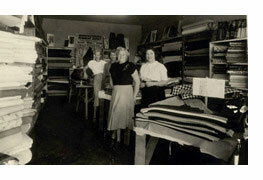 Many have even played an integral part in the company for over thirty years. Sign up to receive our consumer newsletter for info on new designers, patterns and more! © 2005-2018 Robert Kaufman Fabrics - Robert Kaufman Co.